My professional career has always been in footwear, before I joined Primark almost 3 years ago, I was a Technical manager at a fashion retailer based in Cheltenham. The position came up at Primark and understanding the challenges of this large brand attracted me. 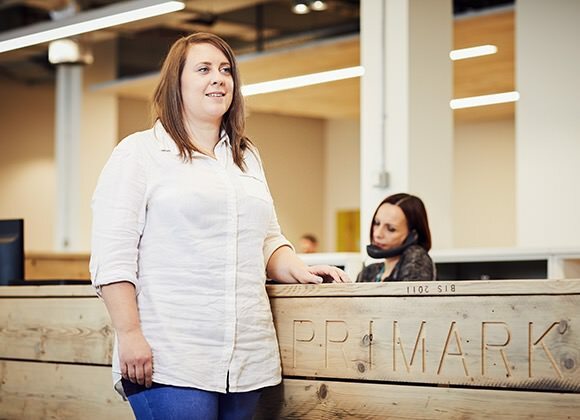 Initially, when I first started with Primark, I was the only Technical manager covering Men’s, Women’s and Children’s footwear across both the Reading and Dublin buying offices; this was a huge challenge but something I relished in. The team has grown and I have now Esther, my new counterpart, based in the Dublin office who comes from a buying background which is a great balance for the team. I have always been passionate about footwear; I completed a Footwear Design degree at De Montfort University and my first employment was as a designer for small brand. I had always enjoyed the technical side to my studies and decided to take the opportunity of a Trainee Footwear technologist role for a very well-known Footwear brand and a move back to Wiltshire, taking this chance has got me to where I am now. One part of my job that I really enjoy is the travelling. I have been fortunate throughout my career to have travelled to some amazing places including Europe, India, China and Vietnam. Every season we travel to China, we get out to the source of our product. Whilst visiting the factories, we look at production, reducing any issues and make the changes on the production line where needed, and engaging with supplier’s face to face rather than over email. We also conduct seminars with all our suppliers to really promote the hard work we as a technical team put together. Having the teams come to me for my expertise and advice is a very rewarding part of my job. Building a relationship with a team who have worked hard previously can be quite difficult when you approach as a stranger. Building trust is key, and the first time they involve you and ask for your guidance, the hard work and training completed is definitely worth it. We are constantly striving to improve the quality of our products to change the customer’s perception of Primark.